A note-taking app is obviously a good fit for your wrist – not only for quickly creating new notes, but also for viewing the ones you’ve already added from your phone or tablet. If you use Keep for grocery shopping lists, you may find it easier to glance at such information on your watch instead of your smartphone. 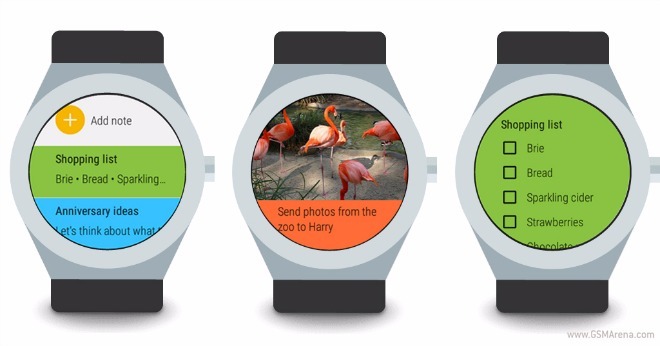 You can start Google Keep on Android Wear from the app list, or simply by saying “OK Google, open Keep”. To create a new note, say “OK Google, take a note”. On your watch, swiping up and down lets you browse through your notes, and you can add reminders to them too. With this update, Google Keep starts supporting recurring reminders as well. Google Keep for Android is available for free in the Google Play Store. You can also use Keep on the Web, or through its Chrome app.